For President Donald Trump, the economy is the gift that keeps on giving — talking points. Trump began his State of the Union address citing the growth in the economy since his inauguration. However, the crux by which Trump’s speech will live or die is whether Americans will simultaneously buy into his image of American prosperity and his portrayal of crises at the country’s border and beyond. Post-shutdown, and still facing the looming threat of another, Trump made broad appeals for unity while repeating his warnings about border that comprised nearly a fifth of his speech. “Year after year, countless Americans are murdered by criminal illegal aliens,” Trump said, citing Immigrations and Customs Enforcement officers’ 266,000 arrests of undocumented immigrants, among other statistics. Stacey Abrams, who was the Democrat’s Georgia gubernatorial candidate, delivered the Democratic Response. She seemed to respond not to specific points in Trump’s speech, but instead opted for an anecdotal approach, talking, for example, about government workers affected by the shutdown. Taken together, the speeches highlight Trump’s struggles with two walls: the physical wall between the U.S. and Mexico he wants to build, but for now exists only in his mind; and the taller ideological wall between Democrats and Republicans that he says must be torn down, but whose persistence has real implications for policy-making and gridlock. As always, some of the most interesting events of the State of the Union address happened outside of the speech itself. Rows of Democratic congresswomen dressed in white to call attention to women’s right, forming a solid trapezoid in the audience. And when Trump’ made his call for unity, Speaker of the House Nancy Pelosi stood up and clapped loudly at Trump in an iconic moment: as if to say, let’s see you put your actions where your mouth is. 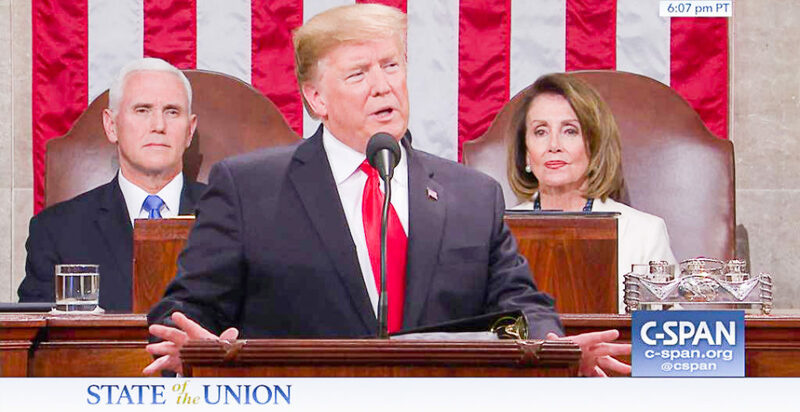 Despite weeks of uncertainty surrounding the date of the State of the Union this year, President Donald Trump spoke on Tuesday in front of a Congress that, while together, still was very divided. The nearly 90-minute speech reiterated most of the same talking points Trump has touted on Twitter since his inauguration two years ago. This included self-praising for an economy growing under his administration, wide cuts to regulations and diplomatic meetings with Kim Jong-un. However, many of his claims were either exaggerated, misleading or false altogether. One notable example was Trump’s unsubstantiated opinion that had he not been president, we would have gone to war with North Korea. Rarely were legislators on both sides of the aisle standing with applause for Trump’s address — in stark contrast to the President’s calls for unity. This comes in the midst of a temporary reprieve of the longest government shutdown in American history. The issue at the root of the shutdown — immigration — still has yet to be solved by a Congress where neither side is willing to compromise. And these tensions especially pierced through the house chamber as the President pivoted toward his support for a border wall — clearly using the platform to flip more Americans to be in favor of the barrier. Yet, Democrats continued exuding their formidable new majority in the House of Representatives. The party’s congresswomen, who make up more of Congress than ever before, wore white to echo the women’s suffrage movement. The image made the two parties look even more contrasting to the always-standing Republican party. By the end of the night, the President did give the nation a state of the union, though not one as clear or united as he claimed.